Justin Randall Timberlake (born January 31, 1981) is a two-time Grammy Award-winning American pop/R&B singer, and actor. He came to fame as the frontman of pop boy band 'N Sync. In 2002, he released his debut solo album, Justified, which went on to sell over seven million copies worldwide. Timberlake's second solo release, FutureSex/LoveSounds, was released on September 12, 2006 including the hit songs "Sexyback" and "My Love". Timberlake was born in Memphis, Tennessee to Randall Timberlake and Lynn Harless. His paternal grandfather, Charles L. Timberlake, was a Baptist minister, but Timberlake considers himself more "spiritual than religious". His parents are now divorced and both have remarried; his mother, who now runs an entertainment company called JustinTime Entertainment, has remarried to Paul Harless, a banker, while his father, a choir director at a Baptist church, has two children, Jonathan and Stephen, from his second marriage. Timberlake grew up in Millington, a small town just north of Memphis. In 1993, he got his first taste of fame when he joined the ranks of The Mickey Mouse Club. There he met future girlfriend and pop superstar Britney Spears, future tourmate Christina Aguilera and, perhaps most importantly, future bandmate JC Chasez. When the show ended in 1995, Timberlake recruited Chasez to be in a new all-male singing group he was forming with friend Chris Kirkpatrick. The group would come to be known as 'N Sync. In 1999 Justin acted as Jason Sharpe in the made-for-TV movie Model Behavior. Timberlake's biggest inspiration is The King of Pop, Rock & Soul Michael Jackson, which is noticeable in his dancing and singing style. Timberlake was a member of the popular 1990s boy band, 'N Sync, and was considered a teen idol. The group formed in 1995 and started their career 1996 in Germany and hit it big in the States two years later in 1998, eventually releasing the fastest-selling album of all time, No Strings Attached in 2000. In 2002, after the completion of their Celebrity Tour and release of "Girlfriend", the third single from their 2001 album Celebrity, the group decided to take time off, at which point Timberlake began work on his first solo album. He hoped the album would shed him of his squeaky-clean boyband image in favor of a sexier, more mature look and sound. Around this same time, in March of 2002, Timberlake split from long-time girlfriend and fellow popstar Britney Spears. The break-up heavily influenced Timberlake's writing for his upcoming album, as many songs touched on the topic, most notably the hit single "Cry Me A River". Justified, 2002On August 29, 2002, after months of recording the album, Timberlake gave a performance at the 2002 MTV Video Music Awards, where he premiered his first single, "Like I Love You", a sparse dance track produced by The Neptunes. The song became a hit, reaching #11 on the Billboard Hot 100. Following the single, Timberlake released his debut solo album, Justified, on November 5, 2002. The album was also a success, despite selling considerably less than previous 'N Sync efforts. It debuted at #2 on the Billboard 200 album chart, selling 439,000 copies in its first week of release. It eventually went on to sell over 3 million copies in the U.S. and over 7 million copies worldwide. The album contained several tracks which were created to be part of Michael Jackson's Invincible album but didn't make it to the final selection of songs used for it. The album also received critical acclaim, thanks to its heavy R&B influence provided by hip-hop producers The Neptunes and Timbaland. It spun off hits throughout late 2002 and 2003, including the top ten singles "Cry Me a River" and "Rock Your Body". Timberlake supported the album by co-headlining the Justified/Stripped Tour with Christina Aguilera in the summer of 2003. For many dates, The Black Eyed Peas served as the opening act; Timberlake appeared uncredited on their smash hit "Where Is The Love?" which was also released in the summer of 2003. His record company did not want Timberlake to be credited for fear that it would take focus away from his solo releases; still, Timberlake often appeared with The Black Eyed Peas to perform the track live, including during the 2003 MTV Europe Music Awards. By the end of the year, Timberlake recorded a song entitled "I'm Lovin' It." It was used by McDonald's as the theme to their "I'm Lovin' It" campaign. In February 2004, during the halftime show of the Super Bowl XXXVIII, Timberlake performed with Janet Jackson before a television audience of over 140 million viewers. At the end of the performance, Timberlake tore off a part of Jackson's black leather costume in a "costume reveal" meant to accompany a portion of the song lyrics, "gonna have you naked by the end of this song". Part of the costume became detached, and Jackson's breast was briefly exposed. Timberlake apologized for the incident saying that he was "sorry that anyone was offended by the wardrobe malfunction during the halftime performance of the Super Bowl... It was not intentional and is regrettable". The phrase "wardrobe malfunction" has since been used by the media to refer to the incident and has entered pop culture. As a result of the controversy, Timberlake and Jackson were banned from the 2004 Grammy Awards unless they agreed to apologize on screen at the event. Jackson declined. Timberlake attended and issued a scripted apology while accepting the first of two Grammy Awards he received that night (Best Pop Vocal Album for Justified and Best Male Pop Vocal Performance for "Cry Me A River"). He had also been nominated for Album of the Year for Justified, Record of the Year for "Cry Me A River", and Best Rap/Sung Collaboration for "Where Is The Love?" with The Black Eyed Peas. After the Super Bowl controversy, Timberlake put his recording career on hold in an attempt to jumpstart his acting career. Timberlake had a few minor acting roles during his early music career, including a bit part as a model in the 2000 made-for-television film Model Behavior, and a cameo in the 2001 film On the Line, but he wanted more substantial roles. The first role he took during this time was as a journalist in the thriller Edison Force, which was filmed in 2004 and received a direct-to-video release on July 18, 2006. He will also appear in the films Alpha Dog, Black Snake Moan, Richard Kelly's Southland Tales, and voice a young King Arthur in the animated film Shrek the Third, which will be released in 2007. He also appeared as a young Elton John, in the video for John's song, "This Train Don't Stop There Anymore"
Meanwhile, he continued to record with other artists. After "Where Is The Love? ", he again collaborated with the Black Eyed Peas on the 2005 track "My Style" from their album Monkey Business. Additionally, Timberlake was featured on Nelly's song, "Work It", which was remixed and included on Nelly's 2003 remix album. When recording the 2005 single "Signs" with Snoop Dogg, Timberlake discovered a throat condition. Nodules were subsequently removed from his throat in an operation that took place on May 5, 2005. He was advised not to sing or speak loudly for at least a few months. In the summer of 2005, Timberlake started his own record company, JayTee Records. FutureSex/LoveSounds, 2006Timberlake had a cameo in Nelly Furtado and Timbaland's video for her single "Promiscuous". 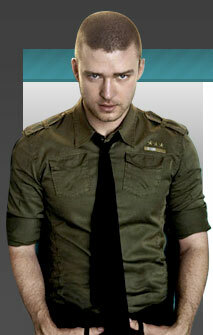 He released his second solo album, FutureSex/LoveSounds, on September 12, 2006. The album, which Timberlake created in 2005, debuted in the number one position on the Billboard chart, selling 684,000 copies its first week. The album is also the biggest album ever for pre-orders on iTunes, and beat Coldplay's record for the biggest one-week sales of a digital album. The album was produced by Timbaland, will.i.am, Rick Rubin and Timberlake himself, and features guest vocals by Three 6 Mafia, T.I. and will.i.am. A studio representative described it as being "all about sexiness" and aiming for "an adult feel". The album's lead single, "SexyBack", was performed by Timberlake at the opening of the 2006 MTV Video Music Awards. It began receiving radio and Internet play on July 7, 2006, and premiered at #90 on the Billboard Hot 100 singles and by week nine it reached number one, where it remained for seven consecutive weeks. "My Love", the album's second single, also produced by Timbaland and featuring rapper T.I., reached number one on the Hot 100 for the week ending November 11, 2006. "LoveStoned" is rumored to be the third single due to him performing it at the 2006 European MTV Music Awards. In October of 2006, Timberlake confirmed that he would focus on his music career rather than his film roles, specifying that it would be a "dumb thing to do at this point" to leave the music industry. Timberlake has opened several restaurants in the United States. He also started the William Rast clothing line, sold in Bloomingdale's, with childhood friend Trace Ayala. The 2007 line will contain cord jackets, cashmere sweaters, jeans and polo shirts. In 2004, ABC hired Timberlake to write a song for its NBA coverage. In October of 2005, the Grammy Association awarded Timberlake for humanitarian efforts in Tennessee, alongside writer/director Craig Brewer, also a Memphis native. Near the end of 2002, Timberlake was the first celebrity to appear on Punk'd, a "candid camera" type show created by Ashton Kutcher to trick celebrities. Three episodes later, he set up Kelly Osbourne to be "punk'd", thus making him the first celebrity to appear on the show more than once. Timberlake later spoofed Ashton Kutcher and Punk'd in an episode of NBC's Saturday Night Live. He recently hosted the 2006 European MTV Music Awards.On December 16 2006, he set to host Saturday Night Live doing double duty as the host and musical guest, he prevouisly hosted in 2003. Timberlake dated fellow pop singer Britney Spears for several years. The two appeared on the New Mickey Mouse Club together and broke up in 2002, amid rumors of Spears' infidelity. Timberlake has since dated actress-singer Alyssa Milano (between September and October of 2002). Timberlake is currently dating actress Cameron Diaz. In June 2006, several tabloids reported that the couple had broken up, citing the age difference between them and Justin's apparent desire to 'sow his wild oats' when he embarks on a world tour in the near future (dates unknown). A representative for the couple says that the two are still together. Timberlake was given Sexiest Man titles by Teen People and Cosmopolitan magazines.